Family of translators which flourished at Rome in the thirteenth and fourteenth centuries. Earliest known member of the family; called the "Prince of Translators" and the "Italian Tibbonide"; lived in Rome from 1279 to 1283. His native place seems to have been Cento, whence his name "Me'ati," which is the Hebrew equivalent of "Cento" (= 100). 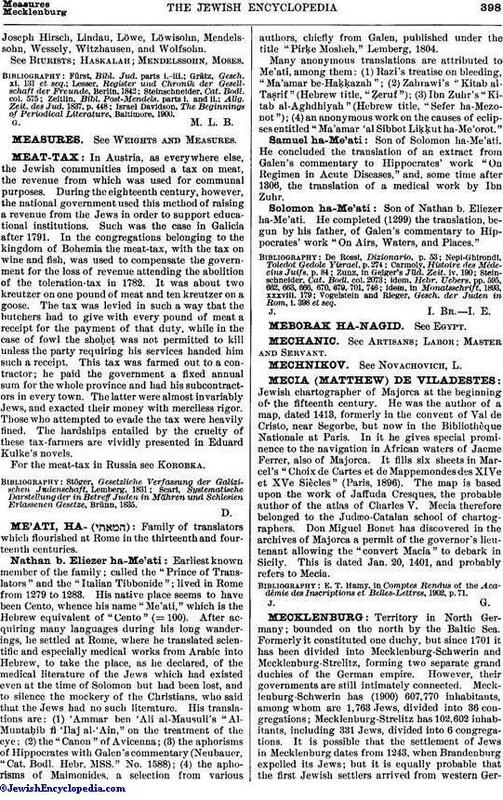 After acquiring many languages during his long wanderings, he settled at Rome, where he translated scientific and especially medical works from Arabic into Hebrew, to take the place, as he declared, of the medical literature of the Jews which had existed even at the time of Solomon but had been lost, and to silence the mockery of the Christians, who said that the Jews had no such literature. His translations are: (1) 'Ammar ben 'Ali al-Mausuli's "Al-Muntaḥib fi 'Ilaj al-'Ain," on the treatment of the eye; (2) the "Canon" of Avicenna; (3) the aphorisms of Hippocrates with Galen's commentary (Neubauer, "Cat. Bodl. Hebr. MSS." No. 1588); (4) the aphorisms of Maimonides, a selection from various authors, chiefly from Galen, published under the title "Pirḳe Mosheh," Lemberg, 1804. Many anonymous translations are attributed to Me'ati, among them: (1) Razi's treatise on bleeding, "Ma'amar be-Haḳḳazah"; (2) Zahrawi's "Kitab al-Taṣrif" (Hebrew title, "Ẓeruf"); (3) Ibn Zuhr's "Kitab al-Aghdhiyah" (Hebrew title, "Sefer ha-Ṃezonot"); (4) an anonymous work on the causes of eclipses entitled "Ma'amar 'al Sibbot Liḳḳut ha-Me'orot." Son of Solomon ha-Me'ati. He concluded the translation of an extract from Galen's commentary to Hippocrates' work "On Regimen in Acute Diseases," and, some time after 1306, the translation of a medical work by Ibn Zuhr. Son of Nathan b. Eliezer ha-Me'ati. He completed (1299) the translation, begun by his father, of Galen's commentary to Hippocrates' work "On Airs, Waters, and Places." Vogelstein and Rieger, Gesch. der Juden in Rom, i. 398 et seq.